Click on a program name or logo to go to the program's dedicated page. The American Aid Foundation is dedicated to helping out homeless Americans, especially homeless Veterans! We feel the plight of the homeless Veterans is an especially sad one because those who put their lives on the line for our freedom should NEVER have to deal with not having a roof over their head or a meal to eat! Please help us relieve the hopelessness that these homeless Veterans and other homeless experience by generously donating to the American Aid Foundation so that together we may help to eliminate the tragedy of homelessness. Read more... click here. This American Aid Foundation program is designed to bring positive life experiences to those who are in need such as hospitalized, special needs, abused or neglected children, hospitalized Veterans as well as seniors in nursing homes. Read more... click here. The American Aid Foundation will be bringing the full movie theater experience, complete with High Definition Front Projection and Surround Sound, to those children, seniors and Veterans who are unable to go to the theater, whether it be health, developmentally delayed, economic or other of life's hardship reasons. Help us bring hours of enjoyable entertainment experiences into those in need with a generous donation to the American Aid Foundation (via our online donation button or send check to address on our contact page). Also check out our Wish List page for items needed for this and our other programs. Read more... click here. 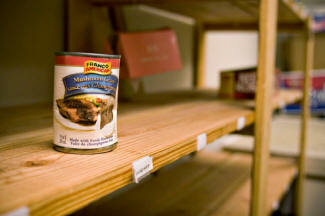 The American Aid Foundation is working with businesses to host "Events", specific to the individual business, to not only collect much needed food items but also to bring public awareness to the plight of the community food pantries whom can not keep food on their shelves to help those in need. You can help by either making a donation (monetary or In-kind) to the Foundation or contact us to see about hosting a "No Shelf Left Empty" event to collect food for the local food pantry that serves your community. Read more... click here. 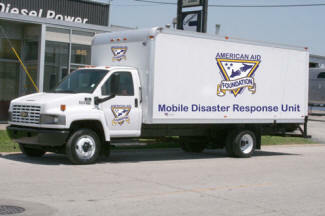 The American Aid Foundation is in the process of putting together Mobile Disaster Response Units which will be 20' or larger trucks that will be filled with needed items following a disaster such as debris removal, flood water removal, food preparation as well as comfort and hygienic supplies. You can help us launch this program by either making a monetary donation or checking our Wish List page to donate items needed there. Read more... click here.